With the advent of wireless sensors as part of an automation system, one challenge is determining if the sensors are actually working, and then if there’s a question, determining the issue. 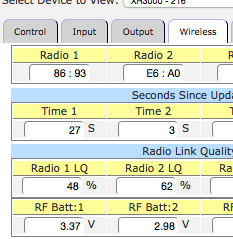 Important questions to ask are 1) how long since I’ve heard from the sensor, 2) how good is the RF signal quality, and 3) does the sensor have power? The Wireless Tab in the new Tabbed interfaced of HarvestWatchTM displays all three of these parameters per wireless sensor. The new IAS RF90 Remote Wireless Sensors transmit this information back to the IAS XR3000 base station each time it sends new data. The IAS XR3000 tracks the amount of time it has been since the last update, so it’s easy to determine how old the data is. IAS Introduces next generation wireless sensor RF90II. We develop products for Automated Irrigation Pump Control, Frost Protection, Soil Moisture, Temperature and Weather Monitoring and Alerting for the Agricultural and Industrial . Irrigation Automation Systems © 2014. All Rights Reserved.